References LayoutData< T >::boxLayout(), LayoutData< T >::dataIterator(), LayoutData< T >::define(), BaseIVFactory< T >::m_ebisl, BaseIVFactory< T >::m_sets, and LayoutIterator::ok(). 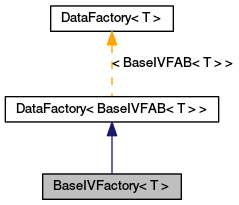 builds BaseIVFAB objects defined at all boundary irregular cells. References LayoutData< T >::dataIterator(), LayoutData< T >::define(), EBISLayout::getDisjointLayout(), BaseIVFactory< T >::m_ebisl, BaseIVFactory< T >::m_sets, and LayoutIterator::ok(). Implements DataFactory< BaseIVFAB< T > >. References BaseIVFactory< T >::m_ebisl, and BaseIVFactory< T >::m_sets. Referenced by BaseIVFactory< T >::BaseIVFactory(), and BaseIVFactory< T >::create().